According to the latest market report published by Transparency Market Research titled “Bottle blowing machine Market: Global Industry Analysis, Size, Share, Growth, Trends and Forecast, 2017-2025,” food and beverages end-use segment is expected to be the largest revenue contributor to the global bottle blowing machine market during the forecast period, 2017-2025. Global revenue generated from sales of bottle blowing machine in 2016 was nearly US$ 1.90 Bn, which is projected to increase at a CAGR of 3.0 % during the assessment period. Growing consumer preference for bottled water will foster the need for blowing machine market. However, global bottle blowing machine market may encounter with a major challenge limiting its growth in near future, attributed to stringent government regulations in different countries. Regulatory norms will reportedly pose a restriction for the market’s growth through to 2025. Huge, uncontrollable waste produced due to plastic on a global level is forcing governments to restrict the production and sale of bottles. Moreover, bottle blowing machines are best suited for manufacturers with high output, whereas prices of bottle blowing machines seem to be unaffordable for small and regional manufacturers. This factor will significantly limit market growth by 2025 end. In some cases, the manufacturing output volume is relatively lesser and the machine is used only for a short duration, resulting in high idle time of the machine. This factor greatly reduces the productivity of the manufacturing firm. The global bottle blowing machine manufacturers are now focusing on incorporating new technologies in the machine. They are replacing semi-automatic bottle blowing machines with automatic bottle blowing machine that have enhanced features, which further eliminates the possibility of errors caused due to machine inaccuracy. Machinery manufacturers are moving forward and offering features such as remote services, machine simulation, and data acquisition. The global bottle blowing machine market is fragmented based on technologies used for the production of bottles. The technologies involved in bottle blowing machineries are extrusion blowing machine, injection blowing machine and stretch injection blowing machine. Injection blowing machine is widely used in developed countries because of its rugged and simple structure of technology, and stretch injection blowing technology is mostly used for production of PET bottles. 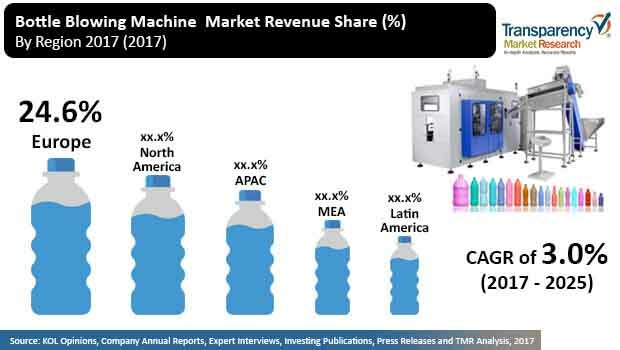 On the basis of end-use industry, the global bottle blowing machine market is segmented into food & beverages, pharmaceuticals, cosmetics & personal care, household, and others. Food & beverages industry is estimated to constitute the largest share of the global market revenue, as the demand for bottled water is increasing rapidly within this domain. This factor will continue to accelerate the demand for blowing machines. Among market segments based on the geographical segmentation, the North American market recorded to capture 26.2% value share of the global market revenue in 2017. North America will remain the key market in global bottle blowing machine market. The manufacturers of blowing machine focus on the expansion of their business in different geographies. Most of them are increasingly investing in emerging markets such as China and India, which may uplift the demand for bottle blowing machines in near future. Some of the players operating in the global bottle blowing machine market include Krones AG, Sacmi Imola S.C, Nissei ASB Machine Co., Ltd., Chumpower Machinery Corp, Aoki Technical Laboratory, Inc., KHS GmbH, Sidel, Guangzhou Tech-Long Packaging Machinery Co., Ltd, SMI S.p.A., Zhejiang East Zhouqiang Plastic & Mould Industry Co. Ltd. etc.